Aleesoft Free iPad Video Converter is a free ipad video converter. 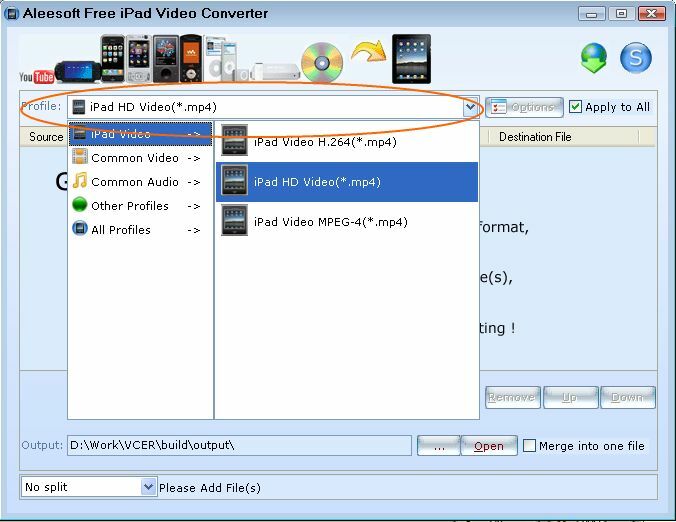 This free iPad converter can help you convert AVI to iPad including iPad HD video, MP4, MOV, M4A, then let you enjoy avi video on your iPad. Audio Video Interleave (also Audio Video Interleaved), known by its acronym AVI, is a multimedia container format introduced by Microsoft in November 1992 as part of its Video for Windows technology. AVI files can contain both audio and video data in a file container that allows synchronous audio-with-video playback. Like the DVD video format, AVI files support multiple streaming audio and video, although these features are seldom used. Most AVI files also use the file format extensions developed by the Matrox OpenDML group in February 1996. These files are supported by Microsoft, and are unofficially called "AVI 2.0". Before converting AVI video to iPad, please download and install Aleesoft Free iPad Video Converter. Step 2: Add video. Click "New Task" button to add avi video to this free AVI to iPad converter, also you can drag and drop avi video file from windows explorer into this iPad converter. Step 3: Convert. Click "Convert" to start converting avi to iPad. After AVI to iPad conversion completed, Aleesoft Free iPad Video Converter can help you add the converted videos to iTunes automatically, then you can transfer the converted iPad video file to your iPad and enjoy. Now download Aleesoft Free iPad Video Converter and start to enjoy the video on your iPad.